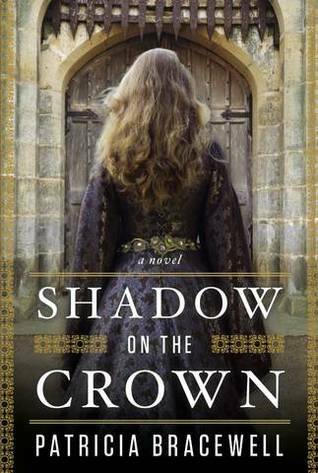 Shadow on the Crown by Patricia Bracewell, Viking, 2013, 416 pages. Bottom line: Highly recommended for public library collections in a smallish-medium sized library and up. Will appeal to Philippa Gregory fans. I love history, especially English history, but I might be about at my limit of what I can read about the Tudor period. (And I've cheerfully devoured pretty much everything.) Lately I've found myself drawn to older and older history. There's an amazing television series The Monarchy narrated by David Starkey; it streams on Netflix, go watch it. When the new work by Patricia Bracewell focusing on Emma of Normandy came into the library, I swooped it up. This work is the first of a planned trilogy on Emma of Normandy and begins with her arrival in 1002 to become the second wife of the aged King of England. From there history and imagination are interwoven skillfully by Bracewell. I'm an author's note buff and so about 1/3rd of the way through the book read the full author's note. I love knowing what I'm reading is true and what is story. What is historical fact and what is not matters little in this story because the characters are believable and true to the time (or true to what I imagine people in the Dark Ages were like). Do you love a good villain? Elgiva is appropriately ruthless and scheming but when we spend chapters told from her perspective we can also see her desires, frustrations, and humanity. Nor is our heroine Emma perfectly saintly. Complex characters play out their theater in an intricately drawn setting. While the technology of the Dark Ages might have been simpler, their politics and lives were not. This book lacks the long, detailed, painstaking researched descriptions of the mundane artifacts of antiquity that other historical fiction authors seem to revel in. No where is there a multiparagraph description of the types, uses, making and wearing of clothing for example. But there was enough detail to put us firmly in the setting without drowning the reader in the proof of their research. (Jean Auel I'm looking at you.) For me, and I suspect for many readers who classify themselves as casual history nerds, it was the perfect balance of historical setting detail, character development and action. No book is perfect, and I do have a few complaints. I felt the storyline with the king's eldest son was rushed and I never entirely bought it. I'm never sure about how I feel with including magic/mysticism/a seer into the books. (And Philippa Gregory does that too.) I know that in barely-Christian Dark Ages Britain that was a part of life, but in fiction it is too often used as a tool for the author to tell not just a prediction but a completely accurate historical truth. And that is a little too easy. But overall this is a very good book. My primary complaint is that I can not determine when the second book will be released. I'm an audiobook addict; well beyond being a fan, I'm bordering into obsessive territory. If I don't have an audiobook lined up when I finish the first one, I'll stop pretty much everything else to search for one. It all started with road trips. Family vacations (and trips to see the grandparents) were always road trips. My mother would stop at the library and fill a shopping bag full of books on tape. And yes they were tapes, cassette tapes. Our first family minivan did not have a cassette tape player so the child in the middle seat was entrusted with a boombox, a bag of batteries, and a bag of audiobooks on cassette. There were rules around the audiobooks, they started at dusk so none of us would strain our eyes trying to read in the failing light. They stopped at rest stops and they didn't restart until we were back on the highway, past the on ramp. An inordinate amount of our family in-jokes are allusions to these books. Most notorious is the time my father picked out the audiobooks. Not realizing there was a separate section of children's books, he brought home Crazy In Alabama which we listened to because not listening to an audiobook was never considered an option. My mother did keep hitting the fast forward button to get us past "those" scenes. When I was working in the library I brought home another questionable choice, The Bear Went Over the Mountain which while hilarious bordered on quite inappropriate for my pre-teen siblings. They weren't all salacious. We sang along with WeeSing when we were little, and read many of childhood's classics that way. Lacking only 30 minutes of being finished with The Day No Pigs Would Die, our family rushed through unpacking the car to sit in the living room, everyone quietly crying, as we finished up that book. Post-college, I returned to Kansas City and returned to audiobooks. My commute was 45 minutes each way and audibooks are far superior to radio. With a 2 hour commute on the weekends to my grad school classes, I was racing through audiobooks. It was then I discovered I loved non-fiction in audio form. I might not know the lyrics to any top 40 songs, but I learned a thousand other things. Should I ever become a Jeopardy champion, it will be due mostly to audiobooks. My commute is much shorter now so I start my audiobooks earlier. I start them while I'm getting ready, doing my hair and make up and continue them until I pull into the library parking lot. I also listen while working out, cleaning the house, knitting, grocery shopping, and cooking. I've looked into audible which is the largest subscription based audiobook service. The maximum plan they offer is 24 books per year. Last year was a slow year for me and I listened to 31 audiobooks. So I save myself several hundred dollars a year by going the free route. That's a very long ramble to make a simple point. We talk a lot about the future of publishing, ebooks, etc. But I don't hear a lot of talk about audiobooks. TV didn't kill radio and I can't imagine that the digital revolution will be anything but good for audiobooks. People are still listening to podcasts and downloadable audiobooks have that same appeal. In an on-the-go society where the average American spends 540 hours per year in their car, audiobooks will always have a niche. Our library has gotten rid of books on cassette. We still purchase books on CD and playaway (I get to select those), but we know that those are also probably transitional formats. If we do go firmly to ebooks (and I'm certainly not saying we will), I imagine we will also go firmly to downloadable audio. I just can't imagine a world where we don't have audiobooks at all. Find me on goodreads, I am trying to get better about reviewing my audiobooks over there. There's no course in management that could prepare you for the breadth of experiences, situations, and people you will encounter managing a public library. I could do this job for the next fifty years and still be faced with an utterly new and surprising challenge every week. This tale is merely this month's. As I have said before, I manage a library in the most urban/economically disadvantaged neighborhood in Anchorage. We share a parking lot with a middle school; technically there are four separate parking lots but you drive through the school's lot to get to ours. It's also extremely ethnically diverse. Now you're up to speed. This has been an almost ridiculously mild winter for Anchorage. The snowfall is light (especially compared to last year's record snowfalls) and we have not had any long lasting or severe cold snaps. So everyone, including the teens, are outside more. Yesterday it was 35F and blazing sunny when I took my lunch break; I might have been the only person in Anchorage wearing a coat and I was overheating. In the last few weeks, the teens (I call them the teens, they're the 11 to 14 year-olds from the middle school who are occasionally joined by a few older or younger kids from other local schools) have taken to playing a football game everyday afterschool. For Anchorage kids, 20-25 is warm enough for an outside pick up game, anything over freezing is warm enough to play shirts versus skins. Unfortunately this is still Anchorage and there is still snow everywhere. The local park is 2 to 3 feet deep and as it melts and refreezes it becomes a sloppy, icy mess. The field for the school is as problematic as the park with the added complication of being off limits during afterschool hours to casual games. The gym at the local community center/boys and girls club is exclusively used for basketball. There is a complete dearth of cleared, playable spaces for a pickup game of football in this neighborhood. However there is a great sized, mostly empty parking lot right outside the library. (Our parking lot is split in two that don't connect and are accessed from different streets of our corner lot.) It's close enough to school and library security that older young adults don't hang around recruiting for gangs and selling drugs like other places in the area. And so every day for about a week and a half, 10 to 20 teens were playing football in the parking lot. I'm completely torn over this. It's a great wholesome activity. With the growing obesity epidemic, I applaud every kid or teen who chooses to get out and play. (Link is to an official state of Alaska campaign.) Plus when kids are outside playing, they burn off steam, energy, and agression before coming into the library. Quite frankly, it was making the library quieter and less chaotic. But one of their end zones is where staff cars, including mine, are parked. And when cars enter the parking lot, the teens most often don't stop their game leaving drivers a choice of trying to push their way in risking damaging their car or the teens or to turn around and leave (hopefully not the library in good, but just for the other parking lot). Pedestrians often cut through that lot can be intimidated by walking through a football gauntlet. Liability issues abound - a kid could be hurt, a football could damage a car, etc. So for almost two weeks I stewed on it. I talked to the kids and reminded them to stop, walk to the edge of the parking lot, hold still and hold the ball still when a car pulled in. That would work for about 5 minutes. Every car that successfully entered the lot eroded away their playing field so it was not in their best interest to allow cars in unimpeded. I made them put back on their shirts because they are on library property and library policy requires shirts. But I didn't outright forbid the game. And I fretted. Last week, it was taken out of my hands. An assistant principal from the middle school came over and broke up the game. An announcement was made over the school intercom forbidding the game in the future. The teens wandered away. I don't know where they took their game, but I hope they found a safe place. This next week is spring break, so I suppose the true test will be if the game continues the week after. I have mixed feelings about the entire thing. The control freak in me doesn't love the school asserting authority in the library's space. (With the proximity of the school, we've worked really hard to establish ourselves as independent in the community consciousness.) There is a regulation in Anchorage that kids are still under the authority of the school from the moment they leave the school's to the moment they walk in their own front door. And none of those kids go home before playing football in the parking lot. The problem is solved-ish. For now. It probably is what had to be done and what I should have done two weeks ago. I kept making excuses that people could go to the other lot (which was getting quite full as people did just that), but football isn't precisely why we have library parking lots. I just wished I felt better about the solution. I was talking to Penguin editors at ALA Midwinter, looking for a good adult read for my post-Newbery life and perhaps complaining about Alaska being misrepresented in books. The editor gave me this book. My One Square Inch of Alaska by Sharon Short, Plume/Penguin, 2013, 327 pages. To begin with, Alaska isn't really in this story except as a dream and a cameo in the end. It can't be misrepresented because it was more the dream of the frontier. That is the Alaska I knew before I moved here and it is still the Alaska I love. From what I can tell, the experiences driving the AlCan (Alaska Canadian highway) in that time period are pretty accurate. Alaskan accuracy aside (and awesome alliteration), let's talk about the book. For me it dragged at the beginning, I had trouble investing in the first bit. By about 1/3rd of the way through I was into it. By the last third of the book, I was in "do not put this book down" mode. At the center of the tale is Donna, a high school senior growing up in Ohio in the 1950s. She has a lot going on in her life, a little brother she cares for and protects from their alcoholic father and abusive grandmother, a burgeoning desire to be a fashion designer, and the overwhelming expectations and mores of small town America in the 1950s. That would be a lot for anyone, but all that falls apart when her younger brother gets sick. Will had been obsessed with collecting cereal box tops and sending away for a deed to "one square inch of Alaska Territory". In a moment of emotion Donna grabs her mother's old convertible, her sick younger brother, an abused husky dog and drives off to find that one square inch. That journey was why I picked up the book however (MINOR SPOILER) that journey doesn't come until near the end of the book. The real journey is Donna's emotional journey. And both journeys, emotional and physical, are realistic and satisfying. The characters are frankly portrayed and richly drawn. One or two characters verge on the stereotyped, but without ever going into the cliche. By the end of the book, they and especially Donna are real enough to you that you are sad to leave them behind. However the author does one of those wonderful epilogues where you find out what happens to the characters. I love those. I get so attached to characters. If I had a criticism of this book, I would say it was trying to do too much. There is the strike/union activity, the sickness of the brother, the mystery about the mother, the alcoholic father, the art teacher, the McCarthy era political fighting, the romance, and a few things I'm leaving out. It's a lot for one short book and honestly one or two of those could have been dropped. Life isn't simple and often many things happen all at once not one issue in a vacuum. Almost every issue/plot string felt organic to the times and the story, save one. I'm not saying which, but one felt a bit forced. However it was not enough to detract from my overall enjoyment of the book. Bottom line: Recommended for older teen and adult readers. Special interest to readers looking for a sensitive coming of age story and anyone who ever dreamed of running away to the frontier.